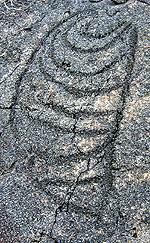 As with many cultures, the Hawaiian people created petroglyphs by etching shapes and designs into the hard pahoehoe lava. 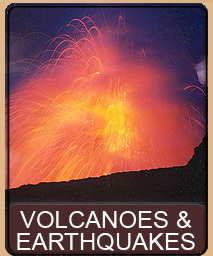 The Big Island has over 70 documented sites featuring petroglyphs. 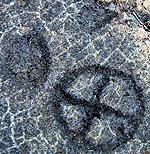 The total count of petroglyphs on the Big Island is around 22,000 images. One of the best, and largest petroglyph fields on the Big Island is the Panau-nui Pu'u Loa petroglyph field in the Hawai'i Volcanoes National Park. This particular field consists of over 15,000 individual petroglyph images that have been scratched and pecked into the hard pahoehoe surface. To find the Pu'u Loa petroglyph field, take Highway 11 to Volcano and enter the Hawai'i Volcanoes National Park. Once you pass the park gatehouse make the first left onto Crater Rim Drive. Continue on Crater Rim Drive until the intersection with Chain of Craters Road. 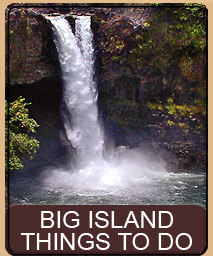 Turn left onto Chain of Craters Road and proceed approximately 16 miles. The petroglyph field is well marked with a road sign. There is also an emergency telephone at the site. Parking is available on both sides of the road. The trail entrance to the petroglyph field is on the East side of the road (same side as the telephone). The trail to the petroglyph field is 0.7 miles long. 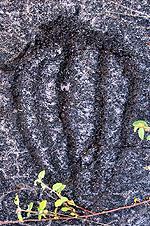 The trail is easy to follow but is over rough pahoehoe lava. You should wear walking shoes and be careful walking as the trail is uneven. There are no bathrooms or other facilities on this trail. You should bring water, sun screen, a hat and (of course) a camera. Since the trail is short you won't need food. Once you reach the end of the trail (about a 20 minute walk) you will find a wooden boardwalk surrounding some representative petroglyphs. While there are many nice petroglyphs within the boardwalk area, the best petroglyphs can be found by leaving the boardwalk (see What You Will See below). To return to your car simply follow the same trail back out. 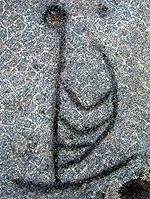 IT IS UNLAWFUL TO DEFACE, MARK OR SCRATCH THE PETROGLYPHS. When walking on the petroglyph field, NEVER step on a petroglyph as this will cause it to crumble. Step carefully around the petroglyphs. This trail is over natural lava rock. There are cracks, small rises and depressions and loose rocks along the trail. 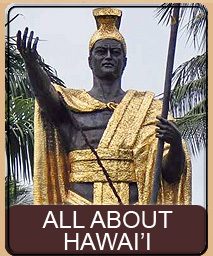 As with all trails in Hawai'i, if you wish to look at something, stop walking. Do not walk and look around at the same time. Never take a step backwards without first looking to see what is behind you (there might be a crack in the ground). After parking your car you begin your walk at the sign near the trailhead on the east side of the road (same side as the telephone). The trail is fairly worn and is well marked with periodic stone piles. 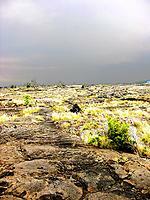 The trail is an old pahoehoe lava flow; while fairly straight you will walk up and down small inclines. 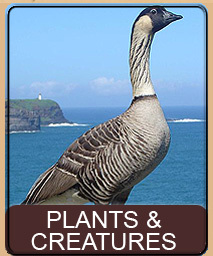 The surrounding area is mostly lava field with various grasses and other small plants. Follow the trail until you get to the boardwalk. From the boardwalk you will find a good selection of various petroglyphs. Most are easy to photograph from the edge of the boardwalk. If you look outside the boardwalk you will also find petroglyphs, especially along the left side of the boardwalk. While the petroglyphs around the boardwalk are very nice and represent a good selection of designs, the real hidden treasures await you if you leave the boardwalk. To find the best petroglyphs, go to the very opposite end of the boardwalk from where you started and step off the boardwalk onto the lava field. Once you leave the boardwalk, to your right is a small hill - and in front of you (and behind the hill) is a fairly level plain of lava. You will find some very nice petroglyphs on top of the small hill; however, the majority of the petroglyphs extend behind the hill, in the flat field, for hundreds of yards. As you walk onto the flat area, be very careful not to step on petroglyphs (this can be difficult in some spots because of the huge number of petroglyphs) as this will cause the edges to crumble and wear. Most of these petroglyphs pre-date western contact. 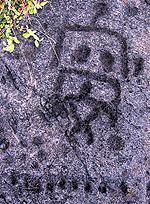 However, you will see a few petroglyphs that are certainly after western contact, such as the schooner ship. A few of the petroglyphs have been done in recent years by people defacing the area - DO NOT ALTER EXISTING PETROGLYPHS OR CREATE NEW PETROGLYPHS. 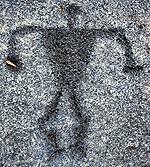 There are a huge variety of petroglyph images. 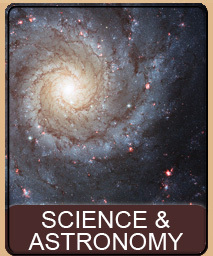 The majority show a variety of human forms as well as simple dots (holes) or dots surrounded by other shapes (circles, spirals, etc). You can also find other unusual petroglyphs, including fish, starfish, hooks, insects, capes (or possibly squid), ships and much more. The petroglyphs that are dots (or holes) relate to a Hawaiian custom specific to this lava field. When a baby was born the piko (umbilical cord) would be taken to the lava field. A hole would be created in the rock and the piko placed in the hole and covered with a rock. If the piko was still there the next day the child was said to have long life. Most of the petroglyph holes you will see were for this purpose. The image on the right shows such holes, and must have represented a huge family or clan. 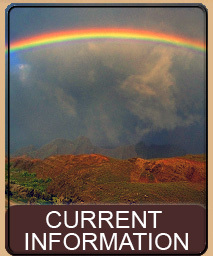 Often you will see what appears to be a number of related images in a grouping. 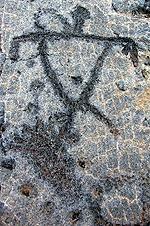 This probably indicates a family group with different members of the family contributing to the petroglyphs over time. You will be able to wander quite a distance, both to the left and right (behind) the boardwalk as well as straight behind it, up to about 1/4 mile. Petroglyphs may be absent in an area, only to start up again further away. As you can see from the pictures in this page, the petroglyphs are all very photographic. These pictures were taken around noontime, a time that one would think would be horrible for such shots - but yet they all came out well. However, the best time to do this walk would be early morning, to catch the rising sun, or late afternoon, to catch the setting sun. Not only is it cooler, but also the angle of the sun should help enhance the etched surface of the lava. While the walk out is only about 20 minutes, you will spend anywhere from an additional 20 minutes (if you only stay on the boardwalk) to an hour or more (if you stray off the boardwalk). There is no way to see all the petroglyphs without spending several hours. Bring plenty of film and water if you intend to spend significant time. 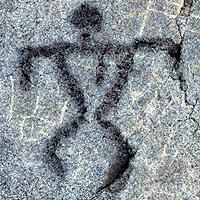 This page is named 'Hikes.petroglyph'. Can't Find It?